I’ve climbed these two hills from all sorts of directions, including a previous report from Glen Doll. But I’ve never come at them from the Glen Prosen side. While Glen Doll has a sort of bustling cosmopolitan feel to it, with its big car park, picnic tables and visitor centre, Prosen feels like sleepy hollow, with the road simply coming to an end at Glenprosen Lodge. I parked on a patch of grass just above the lodge buildings, and walked off on the broad track up the glen—the sun was bright, but the cloud shadows were moving quickly, making me wonder what might come my way later in the day. 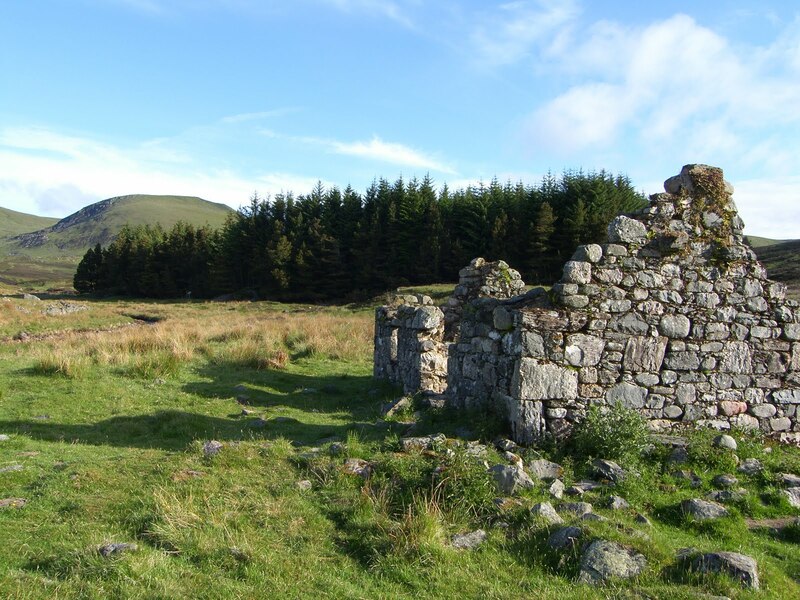 I was heading for Kilbo at the head of the glen, a shieling marked as a “ruin” by the Ordnance Survey. From there, the Kilbo Path rises northwards, to pass between the summits of Mayar and Driesh before descending through Corrie Kilbo into Glen Doll. Kilbo is from the Gaelic cuil bo, “cattle nook”, which could apply to either the northern corrie or the land around the southern shieling. Kilbo proved to be anything but a ruin, however. Some time in the last decade it has been completely rebuilt as a rather fine shelter for (I’d guess) deer-stalking and grouse-shooting. It was locked up solidly, with every shuttered window firmly padlocked in a way that would do credit to a high-security compound in Lusaka, rather than a remote highland cottage. I can only assume that the estate has had problems with walkers causing damage while using the building as a convenient bothy. The Kilbo Path ascends the Shank of Drumwhallo just behind the cottage. “Shank” is a Scots word for a ridge that descends from a hill, and there’s a whole row of them on the north side of Prosen—from west to east, the Shanks of Drumwhallo, Driesh, Strone, Barns and Ord. As I reported in my previous post about this area, Drumwhallo has a counterpart in Glen Doll, the Shank of Drumfollow, which probably has the same etymology—druim falamh, “empty ridge”. Much of the forestry marked on the map in Glen Prosen has been cleared, and the patch of woodland behind Kilbo was no exception. Rather than trudge up through the dispiriting blasted heath that remained, I struck uphill behind the shieling, following a forestry vehicle track up the east side of the cleared area, before crossing the Burn of Kilbo and climbing to join the Kilbo Path on Cairn Dye. A pair of roe deer bounded away as I cleared their sky-line, the male’s antlers sheened with velvet. At its north end in Glen Doll, the Kilbo Path follows a beautifully engineered gradient on the west side of Corrie Kilbo, sheltered from the prevailing winds. Here in the south, though, it follows the ridge line—affording wider views, but always exposed to the wind. I was soon up in the col between Mayar and Driesh, where I turned westwards to visit Mayar first. The intermittent sunshine of the morning was being replaced by lowering dark cloud in the west, so I put on a bit of spurt. Mayar offered a broad view down Glen Prosen, showing the way I’d come in the morning, and the distant dot of Kilbo shieling. Then I was heading eastwards towards Driesh, with the wind strengthening at my back, and the first hint of dampness in the air. Corrie Kilbo still had a cornice of snow decorating its crags, over which I peered down towards Glen Doll. I’d no sooner reached Driesh’s sheltering cairn, than the cloud clamped down over the mountain top and a thin rain started to fall. I didn’t tarry long at the cairn—just enough time to set a compass course south for the Shank of Driesh, which was my route back to the glen. After descending fifty metres or so through cloud, I got visibility back, with the scar of the Landrover track coming up the Shank providing an easy landmark ahead. As I descended, relays of mountain hares took turns at running madly and then freezing to watch me go by, all of them still bearing the last traces of their white winter coats. A batter of sleety rain from the west decided my next move. Rather than follow the ridge-line down, I dropped eastwards towards the ominously named Dead Water, successfully finding some shelter from the wind. From there, I hooked up with yet another Landrover track, this one serving the grouse butts on Shank of Strone, and then descended gently through the (partially cleared) Glenclova Forest. Quite why this forest is named for a glen on the other side of an 800m mountain ridge to its north, I don’t know. After a while, and just as the rain was starting to properly settle in for the duration, I popped out of the forest right next to my car. For once, I had managed to park in a place that was convenient for my return route. I relished another vicarious trek through the hills. Do you make notes en route or write it up from memory after arriving home ? Just wondering . Glad you enjoyed it. I write these up from memory a few days after the walk, wih the map and the photos as aides mémoires. Looks lovely. But as I have said about your walks before it also looks so cold to me! In the photo – “The head of Glen Prosen, with the Kilbo shieling just visible” – there seems to be a lot of “earthworks” on the hill behind the shieling (a word I have learnt thanks to you). Is this the result of clear-felling timber? Yes, the cleared forestry shows up as a stripy grey area rising to the right of the shieling. The trees are planted in rows, so what you’re seeing is alternating lines of stumps and wood debris. It’s an uninspiring landscape to walk through, but a familiar one on Scottish estates. I’ll soon be posting a report of some walks I found unpleasantly hot and humid, in conditions that would be hilariously mild weather for someone from your part of the world. Thanks for that. We had our coldest day for 9 years a few days ago. The maximum was only 14.7 C (about 6 C overnight) and all of us were treating it like the start of the next ice age. Ah, that’s pleasant shirt-sleeves hiking for a Scot. Last week we had sustained high pressure in the North Atlantic, making for temperatures in the low 20’s with a lot of humidity on the west coast of Scotland, where I was hill-walking. Those unacclimatized to that sort of weather will sweat a lot when exerting themselves, leading to problems with hydration and electrolytes. Unfortunately, it takes a week or so for the body to switch to a different salt-and-water economy, by which time the weather system has usually passed.